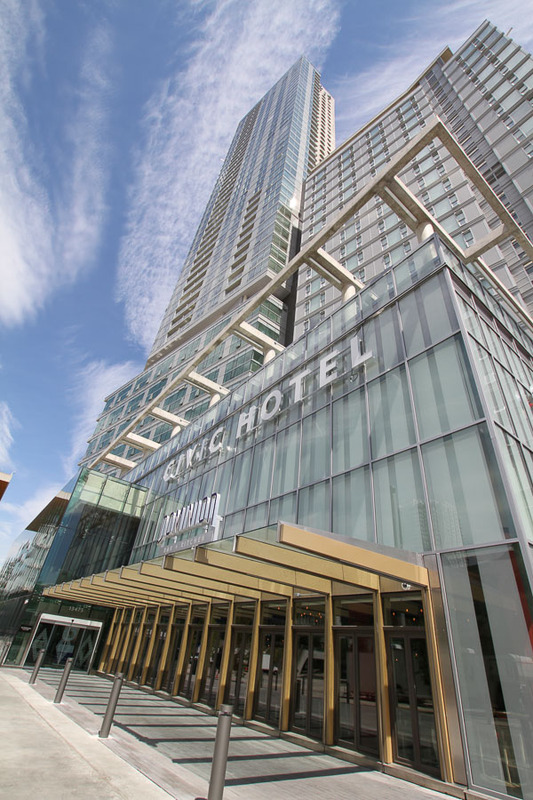 Surrey’s 3 Civic Plaza earned its share of accolades at VRCA’s 2018 Awards of Excellence. The unique guitar-pick-shaped windows featured in the building are a defining quality that helped Starline Windows take home the Trade Contractors – Over $7 Million (Director’s Trade Award) distinction. The structure also nabbed ITC Construction Group (ITC) a Silver Award in the category of General Contractors – Over $50 Million, and the mechanical system brought Sentrax Mechanical its own Silver Award in the category of Mechanical Contractors – Over $9 Million. 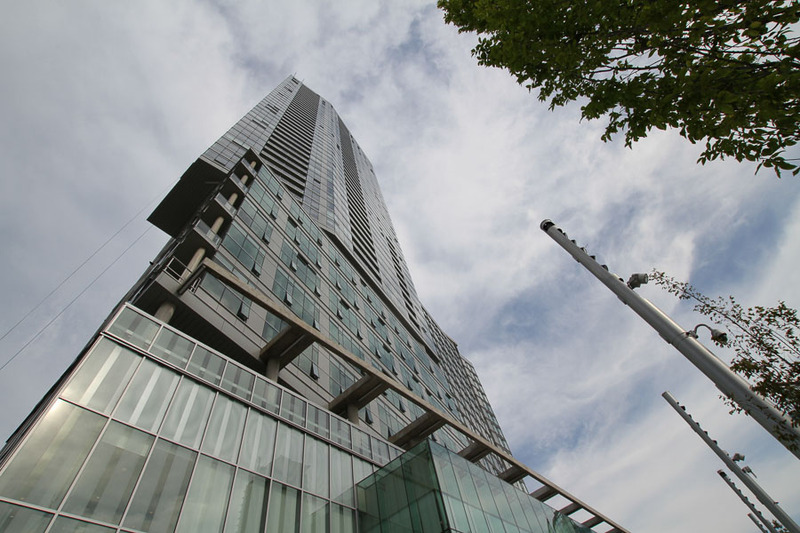 VRCA recently visited the 54-storey mixed-use structure, which is now the third-tallest building in the Greater Vancouver area, and the tallest building in the City of Surrey. 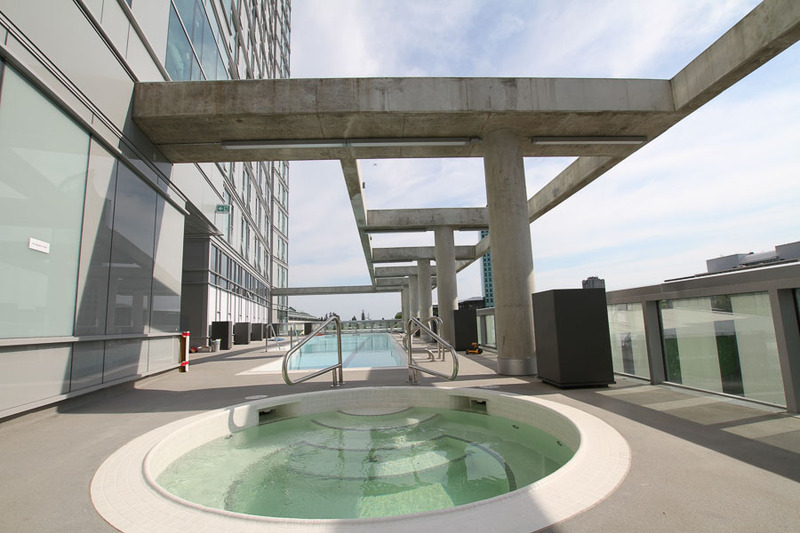 Located at 13495 Central Avenue near the Surrey Central SkyTrain Station, 3 Civic Plaza features 348 residential suites, the Civic Hotel (part of the Marriott Autograph Collection), Kwantlen Polytechnic University’s fifth campus (KPU Civic Plaza), a rooftop garden, outdoor pool and hot tub and a well-appointed fitness centre. While its size is easily the most eye-catching aspect of the building, the more innovative parts of the structure are less discernible. One trait that sets 3 Civic Plaza apart is its exterior shear wall. In order for the project to be competitive in the challenging Surrey market, ZGF Architects LLP couldn’t use a rigid core design typical of other concrete residential towers. 3 Civic Plaza possesses an external shear wall system to allow for better structural economy and more freedom when planning the floorplate. Like making a steel beam deeper, the shear core was made stronger by increasing the distance between the shear walls, subsequently reducing the amount of concrete necessary. With less concrete needed in the external shear walls, an opportunity arose to create the building’s distinctive guitar-pick-shaped windows. 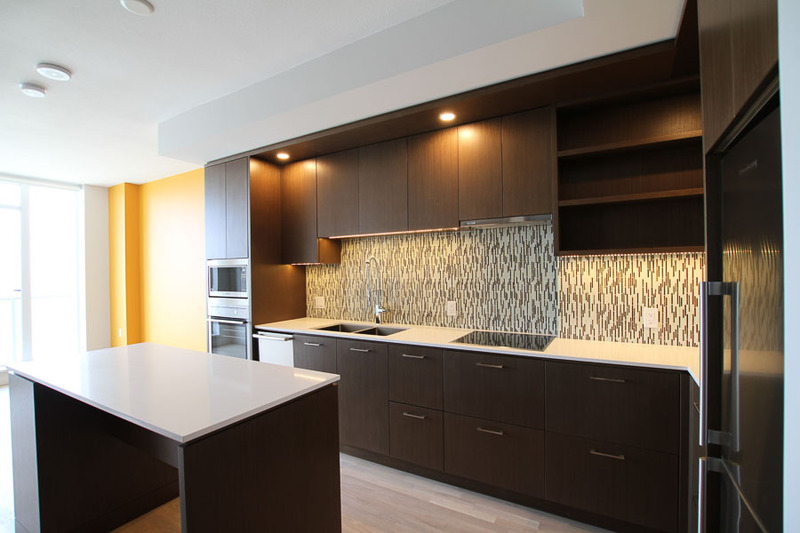 “The architectural design and features of this project were quite unique, so there were a number of challenging elements to this job,” said David Bowyer, ITC’s project director for the development. 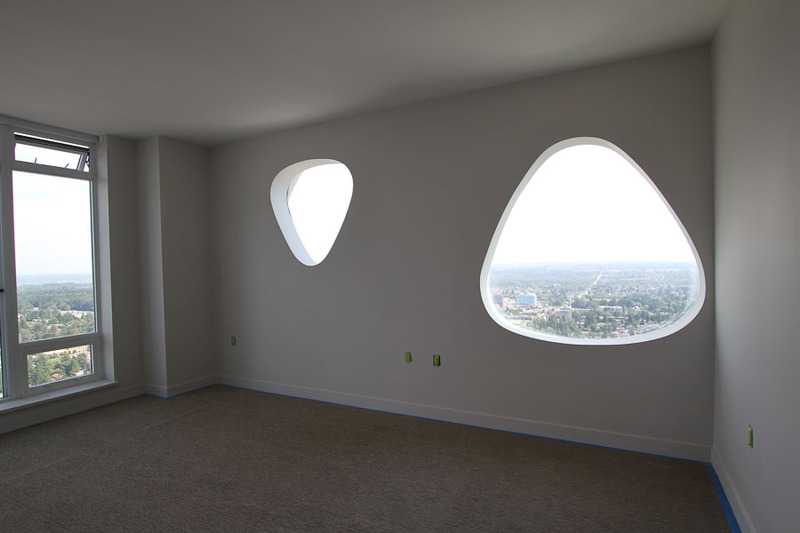 Bowyer noted that the guitar-pick-shaped windows were a challenge to complete, as rebar and formwork had to be placed with care. 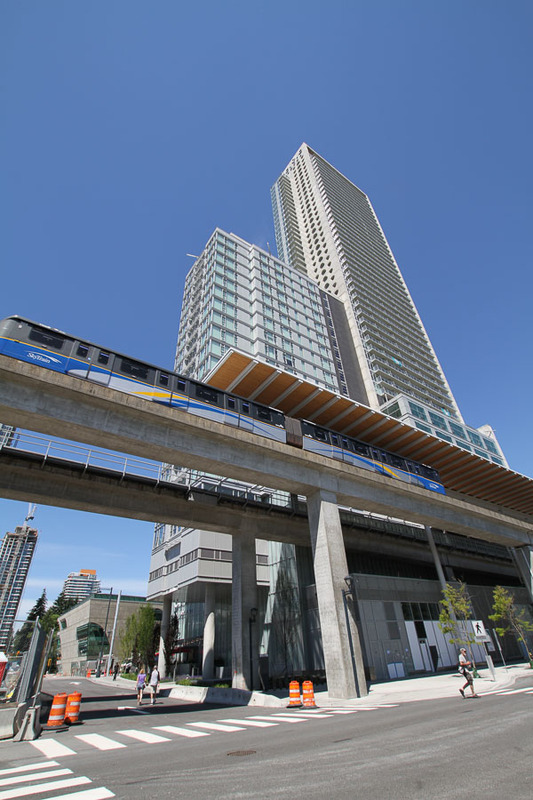 3 Civic Plaza’s proximity to the SkyTrain guideway also presented significant challenges – the tower stands 18 inches from the guideway. Duquette said that due to the scope of the work, special work times and additional safe work procedures needed to be established in order to complete the project. 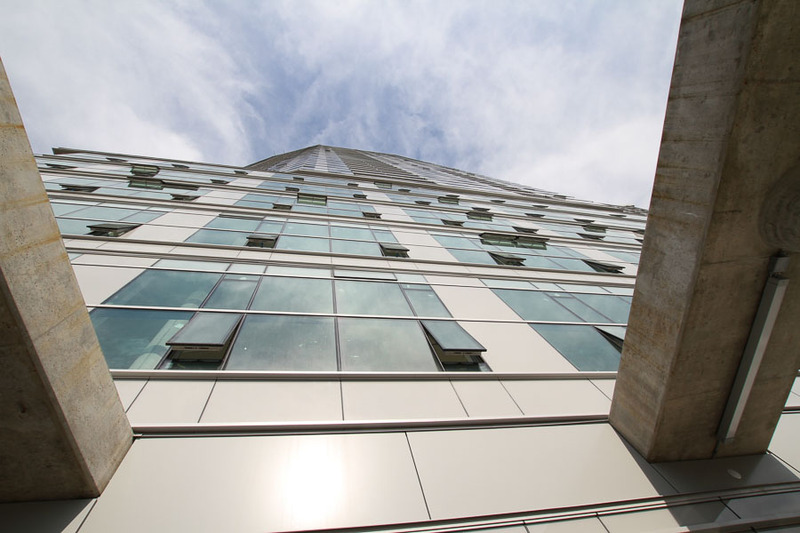 “Due to the height of the building, it was a priority for 3 Civic Plaza’s architects to ensure occupants and guests in the building had access to fresh air,” Cotter said. 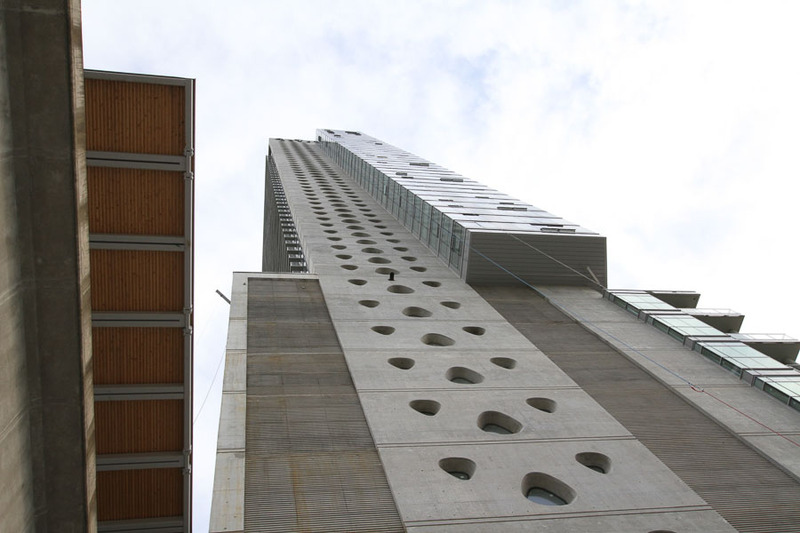 To accomplish this goal, the design used 100 per cent fresh air supplied in dedicated ventilation risers to each hotel or residential suite. ZGF and mechanical consultants Enersolv Design+Build also got creative when designing the HVAC system for the building. In a typical high rise, the heating and cooling system’s hot and cold fluid is circulated in a series of small pipes in the surface or ceiling floor, transferring hot or cool air to the space and its occupants. 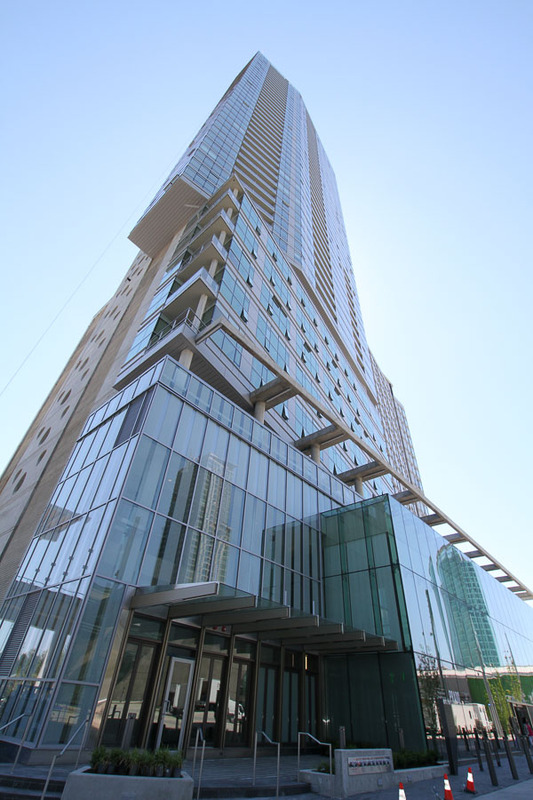 3 Civic Plaza features a shared system of three tanks on every floor, so that each residential suite has its own temperature controls. Up to 65 per cent of the heat energy delivered to the building will be recovered and used elsewhere in the structure. For example, in the areas of the building occupied by offices and by KPU Civic Plaza, there will be a high cooling load. Heat energy will be recovered from the exhaust air from the space and heat energy exchanged with the in-slab cooling system. That heat will then be transferred into the ambient hydronic loop and may be used to heat the water for someone’s shower in a residential suite or warm the water in the swimming pool. The hotel, university campus and residential spaces all receive constant fresh air supply – there is no re-circulated air. Exhaust air from the system is drawn up by ventilation risers and run through heat recovery ventilators at the top of the ventilation risers to extract energy to be used elsewhere in the building. Additionally, instead of traditional top-down air-conditioning, which mixes cold air with stale warm air, the lobby and ballrooms use displacement ventilation. Large volume, low-velocity supply air, chilled to just a couple degrees below ambient room temperature, is introduced at a low level, flooding the floor area. The body heat of those in the room draws a column of that fresh air upwards to the plenum in the ceiling, where it is then extracted. This strategy is much more efficient and much more comfortable than dropping cold air onto people’s heads from diffusers above. The project’s greatest impact however, is its forward-thinking vision for the new civic heart of Surrey. When the City of Surrey relocated its City Hall to the emerging Surrey Central neighbourhood, the new City Hall and Central Library laid the foundations of a plaza, but a third element was needed to ensure its success. 3 Civic Plaza’s mixed-use space provides the activity on the plaza that was missing after work hours, adding to the sense of excitement and community in the area. Thank you to VRCA members who contributed to this project. For more information about how you can share your story in “On Site with VRCA” and the benefits of VRCA membership, contact Membership Services at [email protected]. T. Moscone & Bros. Ltd.